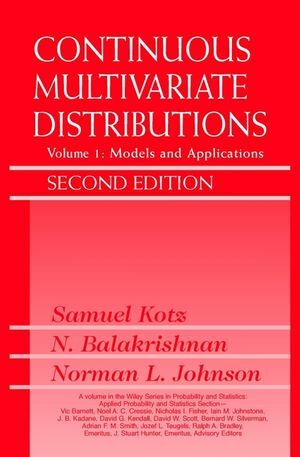 Continuous Multivariate Distributions, Volume 1, Second Edition provides a remarkably comprehensive, self-contained resource for this critical statistical area. It covers all significant advances that have occurred in the field over the past quarter century in the theory, methodology, inferential procedures, computational and simulational aspects, and applications of continuous multivariate distributions. In-depth coverage includes MV systems of distributions, MV normal, MV exponential, MV extreme value, MV beta, MV gamma, MV logistic, MV Liouville, and MV Pareto distributions, as well as MV natural exponential families, which have grown immensely since the 1970s. Each distribution is presented in its own chapter along with descriptions of real-world applications gleaned from the current literature on continuous multivariate distributions and their applications. SAMUEL KOTZ, PhD, is Professor and Research Scholar at the Department of Engineering Management and Systems Engineering at George Washington University. Formerly with the University of Maryland at College Park, Dr. Kotz received his PhD from Cornell University and has held distinguished visiting positions at Bucknell University, Bowling Green State University, Tel Aviv University, University of Guelph, Harbin Institute of Technology (China), and Luleå University (Sweden). He is the coauthor of Urn Models and Applications, Symmetric Multivariate and Related Distributions, Educated Guessing, Process Capability Indices and Recent Advances in Information Theory. He is Editor-in-Chief and founder of the Encyclopedia of Statistical Sciences and holds three honorary doctorates. N. BALAKRISHNAN, PhD, is Professor in the Department of Mathematics and Statistics at McMaster University, Hamilton, Ontario, Canada. In addition to publishing many research papers, he has authored or coauthored numerous books, including A First Course in Order Statistics and Records, both of which are Wiley publications. Dr. Balakrishnan serves on the editorial board of many journals, including Journal of Statistical Planning and Inference, Computational Statistics & Data Analysis, Metrika, Methodology and Computing in Applied Probability, IIE Transactions on Quality and Reliability Engineering, and American Journal of Mathematical and Management Sciences. He is also the Editor-in-Chief f for the series Statistics for Industry and Technology and the series Statistical Distributions and Models with Applications. NORMAN L. JOHNSON, PhD, DSc, is Professor Emeritus in the Department of Statistics at the University of North Carolina at Chapel Hill. Dr. Johnson received his PhD and DSc degrees in statistics from the University of London, and has taught at University College, London, the Case Institute of Technology, and the University of New South Wales. Dr. Johnson is coauthor of the previous four volumes of this book (with Kotz and Kemp; and Kotz and Balakrishnan) and was Editor-in-Chief (with Kotz) of the ten-volume Encyclopedia of Statistical Sciences. He is currently Associate Editor of Metron and a member of the editorial board of Sequential Analysis. Systems of Continuous Multivariate Distributions. 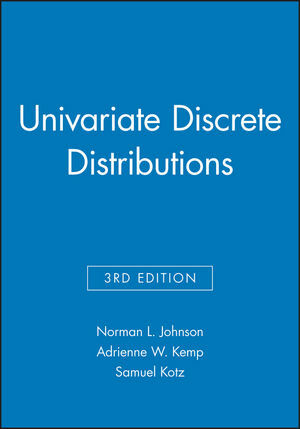 Bivariate and Trivariate Normal Distributions. Dirichlet and Inverted Dirichlet Distributions. Bivariate and Multivariate Extreme Value Distributions.